Every time you plug your smartphone or tablet into canyon mobile charger, you can be sure that your mobile device is safe. Our quality control team puts each product through our own quality control tests. 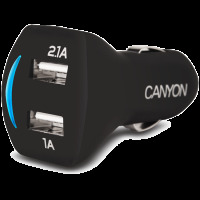 You can use canyon car charger with your own USB cable and it is the best charger for when you or your passengers have different devices to charge. Canyon mobile charger has power to charge two 1A devices. This small but powerful car charger of elegant design suites well any dashboard design.